The chocolate flavor in Honey Bunches Of Oats With Real Chocolate Clusters is very, very similar to that of another Post Cereal most of us know and love... Cocoa Pebbles. This was a pleasant surprise. It was like having a more-adult cereal with a Tablespoon of childhood memories. There's even a good amount of chocolate milk created in the bowl from the coating on the flakes and clusters. The clusters in the cereal are ever-present and do provide the occasional crunch, especially when you get a larger cluster. This cereal is a fairly healthy breakfast option. One 3/4 cup serving has 0 grams trans fat, 0 grams cholesterol and 0 milligrams cholesterol. There's 7 grams of sugar and 25 grams of carbs with 2 grams of dietary fiber. The chocolate in Honey Bunches Of Oats With Real Chocolate Clusters tastes like an addition or an afterthought, rather than an integrated part of the cereal. There's just enough chocolate flavor to obscure what's great about original Honey Bunches Of Oats and not quite enough chocolate flavor to put it in the kid-friendly chocolate category. Unfortunately, I found the strongest aspect of chocolate to be in the aftertaste. It's been 30 minutes since I've had my last bowl and I still have the taste of bitter chocolate in my mouth. This is definitely my least favorite in the Honey Bunches Of Oats cereal line. I'd recommend trying their Honey Bunches Of Oats With Vanilla Clusters instead. While I would personally give this cereal three golden eggs out of seven. I'm going to adjust the rating up to a four. I've found that many breakfast lovers who post their opinions on MrBreakfast.com are a bit more lenient than I am when it comes to chocolate in adult-friendly cereals. If you have a craving for chocolate in your cereal, I'd say to try this one once. It didn't jive with my sensibilities, but I suspect some people will like it. 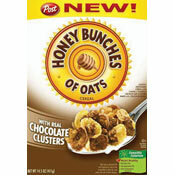 What do you think of Honey Bunches Of Oats w/ Chocolate Clusters? I loved this cereal and it was my favorite of all the brands. I hope Post considers bringing it back on the market. 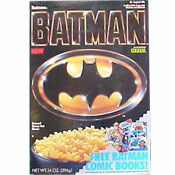 Why did they discontinue this cereal? It was the best. I loveeeeee this cereal... it's the best cereal in the world. I just had a bowl of it lol!!! Yummy!!! Greatest Cereal on earth... too sad that it's getting harder to buy even online. I think Honey Bunches of Oats with chocolate... is good! To me, it tastes like those ice cream waffle cones! I love this breakfast and I was upset that they stopped selling it. I wish it would go back up there. Blech. the old way is the best way. I've tried all the variations on the original, and I go back every time. I thought it would have real chocolate chunks in it but it didn't. I would just stick with regular honey bunches.